Japanese Girls at the Harbor (Minato no nihon musume, 1933) is a striking and atmospheric silent movie from director Hiroshi Shimizu, who had a long and successful career in Japan, but is relatively unknown in the West. Based on a story by Itsuma Kitabayashi, the film may at first appear to be a rather conventional romantic tale, but it manages to evoke nuanced considerations of love, jealousy, the challenges of modernism to traditional values, and also what I might call, “truth and revelation”. The story of this film revolves around three girls in the port city of Yokohama who are all romantically attracted to a handsome young man in the area. The focus is on two best friends, Dora and Sunako, who are students at a Catholic girls school. The plot passes through three basic stages. Sunako and Henry. 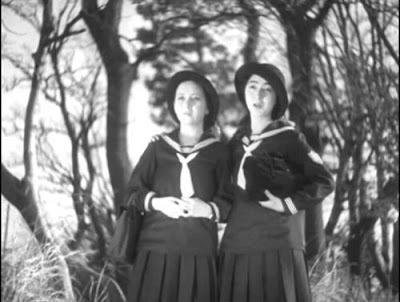 After opening with some atmospheric but impersonal and distancing shots of Yokohama harbor, the scene shifts to Dora and Sunako, who walk home together across a hilltop every day. 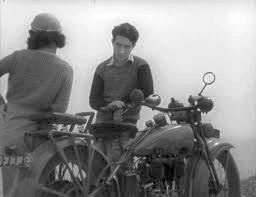 On this occasion the courtly young man Henry drives up to the hilltop on his motorcycle, to the evident delight of both girls. Henry is charming and chivalrous towards each of them, but Sunako is more assertive and s ucceeds in winning his attentions. Dora is crushed but swears fealty to her eternal friendship with Sunako. Soon, however, we learn that Henry likes to hang around the company of punk gangsters and is also seeing an older, more worldly girl, Yoko Sheridan, who seems to be experienced in the affairs of seducing and manipulating men. Dora reports this situation to Sunako, who is overcome with jealousy and, in a dramatic scene, confronts Yoko in the school chapel and shoots her with a gun. Sunako’s Fall. The scene now shifts to new circumstances after some time has passed. 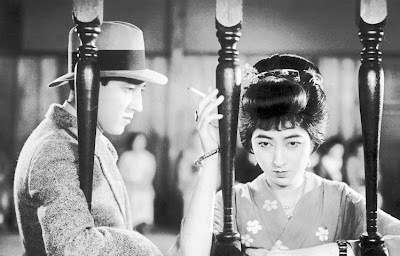 Through a process of slow disclosure, the viewer gradually learns that in the smoky world of prostitutes and gin joints, one of these girls, now wearing the striking garments of a geisha, is Sunako. She has become a different person from the respectable schoolgirl seen in the first act. Meanwhile Henry and Dora are now married, revealing that Dora’s shy, conservative manner was ultimately successful in the game of love. By chance, Henry runs into Sunako in the city and is shocked by what has happened to her. Dora, still loyal to her old friend, seeks to help Sunako and urges her to come to their dwelling for visits. Both Henry and Dora feel called upon to get Sunako to return to a more respectable and virtuous life, but Sunako, presumably aware of the likely unforgiving nature of traditional Japanese society, feels trapped in her situation. Sunako’s Redemption. Henry, trying to turn Sunako around, goes to visit her, but he also finds himself tempted by old feelings and is attracted to her again. Perhaps due to his conflicting emotions, Henry turns to drink and starts hanging out in bars until late at night. Although Sunako is also still attracted to Henry, she reawakens to her authentic self and insists on Henry returning to his wife, Dora. 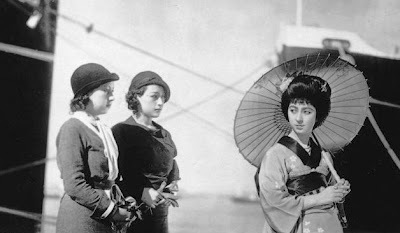 At the end of the film, Sunako departs from Yokohama on a ship, having done the right thing but unsure of what life has further in store for her. There are several interesting aspects of the story of Japanese Girls at the Harbor that make it more interesting than might first appear, The focus of attention here is on women, not men. What we see is a sensitive portrayal of women and how they see and act from their particular perspective, and this portrayal is enhanced by generally subtle acting (despite the sometimes stylized gestures mentioned below) that reveals their depth. As with many of Kenji Mizoguchi’s films, the men in this story are generally shallow and weak. Henry is nice, but seems to have little spine or character. In addition, another personage in the story, the painter Miura, who is Sunako’s later companion in her fallen state, is a friendly but servile camp follower who follows Sunako around like a puppy dog. So the men here are relatively useless, and it is the women who drive the story. Of course, Sunako is an assertive women who takes actions throughout. But even Dora and Yoko Sheridan (who reappears as a chastened and doomed character in Act 3) are attention-drawing and rather complex characters who undergo change in the story. Sunako is the most interesting character and the action-taker. In Act 1 she asserts herself by claiming Henry. Later when Yoko comes to take Henry away from her, Sunako shoots her. In Act 2, Sunako has descended into prostitution, but she is still very much her own woman, making her own living and energetically dominating her hangdog companion, Miura. Finally in Act 3, Sunako is still the decisive character – she reunites Henry with Dora and then chooses to leave Yokohama for new territory. She is the agent that makes things happen in this story. Getting back to that theme of truth and revelation that I mentioned earlier, there is this curious compulsion on the part of characters in the film to intervene by telling the “truth” as they know it. In Act 1 Dora goes to Sonako and tells her what she knows about Henry and Yoko. Yoko also reveals to Henry that she knows about his dallying with Sunako. In Act 2 both Dora and Henry attempt to intervene in Sonako’s life and get her back to a virtuous life. In Act 3 Miura intervenes and reveals what he knows to Henry. Also in Act 3 Yoko Sheridan, having reappeared as a quite different person, also attempts to straighten out Sunako. The sense of respect for the privacy of the individual was evidently less significant in this realm. All of these characters felt the need to establish a common objective knowledge in the society around them, even though new modernist tendencies were making such commonality even less achievable and also revealing that the depth of individual feelings were richer than can be known in the public space and that increased considerations for privacy were more desirable for individuals and public alike. What makes Japanese Girls at the Harbor such a special experience and a must-see film, however, is not the basic story, but the telling. The moody, black-and-white compositions and long tracking shots are consistently evocative of the general feelings of longing and loneliness. In addition there is considerable visual symbolism throughout, often in terms of images that represent the challenges of modernism. A further visual attribute, and one that strikes me as more unique to this film, is the sometimes dramatically stylized gestures of the actors – I am not sure whether these derive from silent movie or perhaps Japanese dramatic traditions. 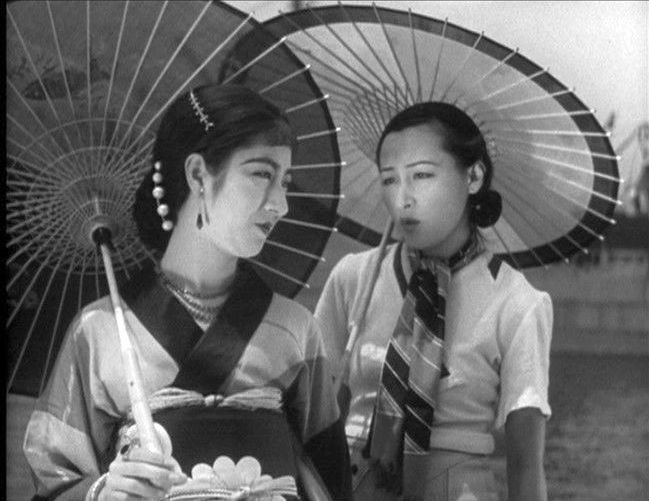 Incidentally, although sound movies came early to Japan, with the first one appearing in 1926, it took some time for talking pictures to take hold – even in the year of this film, 1933, more than 80% of the Japanese productions were silent films. On e curious aspect to the visual presentation was the many intertitles in the film. These numerous textual interruptions might be thought to interfere with the visual presentation – I was always taught that the best silent films were those that didn’t need any intertitles. And yet the brief intertitles in this film don’t seem to get in the way, and seem almost to provide a form of visual punctuation. Overall, Japanese Girls at the Harbor is worth tracking down. In many ways I had the feeling as I watched it that I was seeing a Japanese version of a Josef von Sternberg film, where a simple narrative arc is graced by a leisurely, expressionistic cinematography that entrances the viewer.